Book an appointment. Our Vancouver ceramic coating experts will inspect your vehicle and make recommendations. 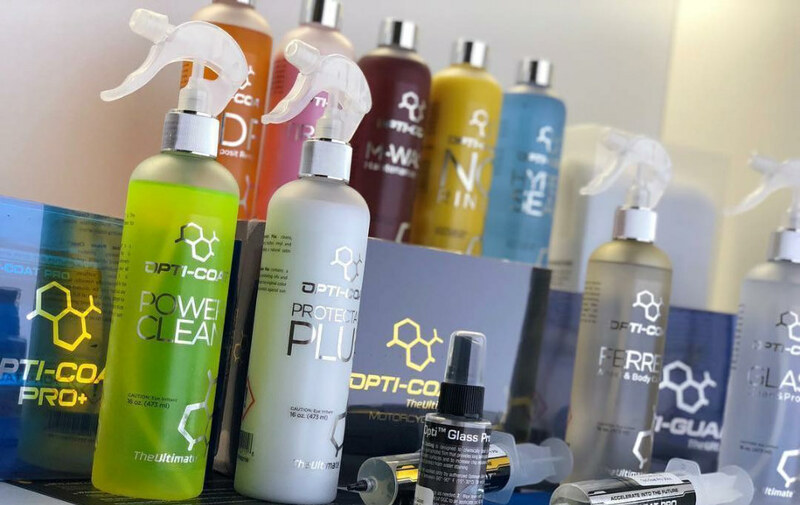 Opti-coat is a permanent, hard, transparent ceramic coating that bonds to your vehicle’s factory finishes – adding a layer of long-lasting protection that will keep it looking newer for longer. It also dramatically reduces the appearance of existing scratches, swirl marks and acid etching from environmental chemicals. An Opti-Coat application results in an ultra-glossy, low maintenance finish that extends the life of factory paint and finishes. Opti-Coat is much harder than factory clear coats (rated 9H – the hardest available) and protects against common wear and environmental damage that would otherwise cause the deterioration of factory paint layers. Opti-Coat is 100 times thicker than typical wax coatings and much longer lasting. Waxes and paint sealants offer only months of protection and break down over time, requiring frequent re-application. Opti-Coat Pro and Opti-Coat Pro+ last for 5 and 7 years respectively and unlike waxes, won’t wash off or wear away. If you want premium finish protection and a flawless high gloss finish that turns heads, then this is the solution for you. Extremely hard, mirror-like finish that car wax cannot provide. Resistance to scratches, swirl marks, chemical and environmental marring or fading. Highly hydrophobic (water repellent) for a dramatic reduction in water staining. Reduction in ongoing vehicle finish maintenance. Extends the life of your factory paint finish and other finishes. Long lasting, no follow-up coats or waxing required. A manufacturer’s warranty (see pricing). After an Opti-Coat treatment, your vehicle finishes will require occasional minimal maintenance to keep them looking great. Your car will be easier to wash and clean and follow-up maintenance coatings are not required. Regularly washing your car and doing annual decontamination will help you maintain the gorgeous, pristine finish and keep the warranty on your coating valid. View the Opti-Coat Car Care Guide. One-step ceramic coating that is harder than a factory finish. Protects against bird messes, acid etching. Resists common wear paint damage from cleaning and the environment. Glossy finish. 3-year warranty. Permanently bonds to and hardens factory clear coat. Better chemical resistance, scratch & mar resistance and a slick, gloss finish. 9H hardness. Also protects metal and plastic. 5-year warranty. Two-step coating. Opti-Coat Pro is applied first. Then, Pro Plus top coat adds best resistance to water spotting, scratching, acid etching, fading. Superior, mirror-like, finish. 7-year warranty. Chemical decontaminationClay towel chemical decontamination. PolishingRemoves deep contamination from the paint, adds extra gloss. 1-cut compoundingRemoves hard water spots. 2-cut compoundingCuts top layer to remove swirl marks and light scratches. Additional cuts & sandingExtra cuts and sanding if needed to remove deeper scratches. Interior detailing and coating packageIncludes: vacuuming, fabric and leather cleaning, and OPTI GUARD protection. Rims detailing and coating packageIncludes: rim removal, deep cleaning and ceramic pro application. * The official warranty information supersedes the "Durability" estimates in our pricing table . View the official Opti-Coat warranty for detailed information. ** Vehicles must be clean prior to service. Car wash is an additional $50. *** Prices listed are rough estimates. Please book a free assessment for an accurate estimate. Gleamworks uses Optimum FerreX™ to dissolve and remove ferrous oxides, tar and wax from your vehicle's painted surfaces and wheels. Residual spots are cleaned with Optimum Power Clean™. A final, no-rinse wash is completed with No Rinse™ Wash & Shine – a technologically superior wash system that leaves no soapy residue and is better for the environment because there is no waste water to discard. The result: a pristine, gloss finish. Compounding is the process of using a cutting compound/paste to remove fine scratches in micro-thin layers of paint or clear coat. Compounding “cuts” out surfaces scratches, extensive hazing, and swirl marks. Each cut removes from 5 to 10 microns of clear coat. At least 2 microns of clear coat is left intact to protect against harmful chemicals and UV rays. Polishing is the final stage of paint restoration. Polishing removes small surface imperfections and results in a highly reflective, glossy surface. Once polishing is complete, the surface is hand cleaned again with soft cloths and alcohol to remove microscopic particles and dust. The vehicle is now ready for the final step: ceramic coating installation. 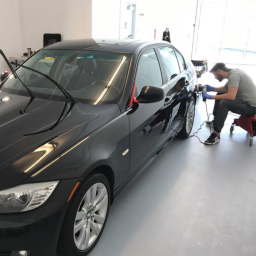 Opti-Coat Pro is a durable, ceramic clear coat that provides superior scratch resistance and protects your vehicle against chemical etching and other environmental deterioration. Opti-Coat is a cross-linked pre-polymer, that results in a hard, shell-like, transparent finish. Opti-Coat Pro has been shown to provide superior resistance to chemicals, scratches and surface marring when compared to any other automotive coating on the market. Your vehicle gets long-lasting factory paint protection that extends paint life and looks great! Opti-Coat may also be used to protect metal and hard plastics. How much does car coating cost? See our pricing table above. The cost of an application is determined by the size of your vehicle, whether additional preparation, decontamination or cut-polishing is required, and which ceramic coating product is being applied. Because the condition of every vehicle is different, you must book an inspection appointment before we can make a recommendation and provide a firm estimate. The price tables above serve as a close approximation of costs. What does the Opti-Coat warranty cover? 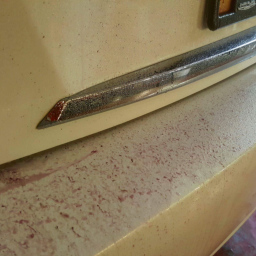 Optimum Polymer Technologies warrant to the owner of the nominated vehicle that if the Optimum Clear Coating (Paint Guard / Opti-Coat Pro / Opti-Coat Pro Plus) is unsatisfactory in its performance of protecting the vehicles factory paintwork from damage or etching from water spots, bird droppings, bug splatter, acid rain, industrial fall out; or UV damage / oxidation, whilst being maintained in accordance with the terms and conditions of this warranty, Optimum Polymer Technologies or its agents will at no cost to the owner repair and retreat the affected area. What does the hardness rating 9H mean? “9H” hardness is the highest hardness rating in what is known as the “Pencil Hardness Test” (also known as the “Wolff-Wilborn test”). Clear coat and paint manufacturers test a coating’s scratch resistance by attempting to scratch the coating using increasing degrees of graphite pencil hardness. There are 20 degrees of graphite hardness starting at 9B (the softest), with HB in the middle of the hardness scale, and 9H (the hardest) at the end of the scale. How many layers of ceramic coating are applied? 2-7 layers of Opti-Coat ceramic coating can be applied, but typically, 2 coats is enough to provide optimal results. Once an optimal result is achieved, additional layers provide no further benefit. Adding many layers of coating is often used as a marketing gimmick, because some consumers assume that more of a good thing must be better. The vehicle owner doesn’t realize they are paying for coating layers that they don’t really need. How long does ceramic coating take to apply? Optimum Paint Guard takes 1 day to complete. Opti-Coat Pro and Opti-Coat Pro+ take 2-3 days to complete. What kind of applicators do use? 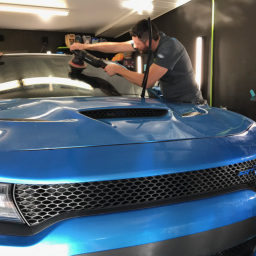 Gleamworks applies Opti-Coat with Optimum Polymer Technologies Blue Foam Applicators – a foam pad specifically designed for the application of Opti-Coat products. Foam applicators are safe for your vehicle’s surfaces. How do I maintain the ceramic coating? Will I need to wax my vehicle? You will not need to wax your car after an application. All that is required is car washing (hand washing is recommended) and a recommended once-yearly decontamination for the Pro and Pro+ versions of the coating. Follow the Opti-Coat Pro maintenance program to ensure your warranty remains valid. Is ceramic coating appropriate for any make and model of vehicle? Ceramic coating is appropriate for any vehicle regardless of the make or model. Although we provide ceramic coating services for a broad range of vehicle types, such as compacts, mid-size family cars, vans and SUVs, we specialize in providing premier coating services to owners of luxury and exotic vehicles, such as Mercedes-Benz, BMW, Audi, Lexus, Porsche, Tesla, Jaguar, Ferrari, Lamborghini, Maserati, McLaren, Rolls Royce, Bentley and more. If you already have ceramic coating, consider our comprehensive interior and exterior detailing services to help maintain your vehicle’s appearance. Where is your ceramic coating shop? What cities do you serve? 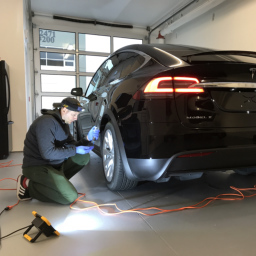 Gleamworks is located in Vancouver, BC, but many of our customers travel from all over the Lower Mainland to receive our ceramic coating services. 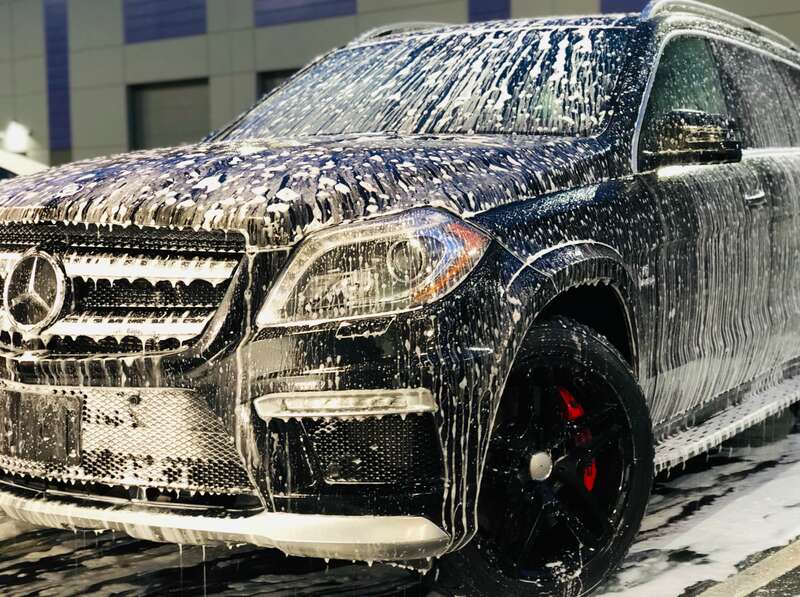 Most of our customers come from Vancouver, Richmond, Burnaby and Surrey, but some travel from far-away for our signature coating and detailing services.